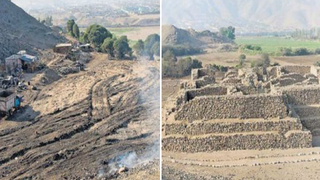 A pair of construction crews have utterly flattened a 5,000 year-old pyramid near Lima, Peru. A similar incident happened in Belize this past May, prompting archaelogists to ask, WHY THE F*CK IS THIS BEING ALLOWED TO HAPPEN? Just to refresh your memories, a construction crew demolished a 2,300 year-old Maya pyramid several months ago in Belize. They did so to extract crushed rock for a road project. The Ministry of Tourism and Culture calling the wrecking of the ceremonial center "callous, ignorant, and unforgivable." Now a similar incident has happend in Peru, but this pyramid — the El Paraiso — was much older and far grander. It is — or rather IT WAS — one of the oldest structures constructed in the Americas, consisting of 12 pyramids covering over 64 hectares. Archaeologist Frederic Engel said in a report that El Paraiso could have held between 1500 and 3000 inhabitants and required over 100,000 tons of rock to construct, which was taken from the hills surrounding the structure, and was likely used for religious and ritual purposes. Evidence shows the culture living there was from the Late Pre-Ceramic Age (2000-3000 B.C.E). Despite its obvious importance to Peruvian culture, this pyramid was knocked down and later burned by several clandestine groups that entered the site on Saturday. Archaeologist Marco Guillén Hugo was in charge of the research and excavation of this site and reported to El Comercio that he had reason to believe two private building companies, Compañía y Promotora Provelanz E.I.R.L and Alisol S.A.C Ambas, were behind the destruction. Guillén says it's not the first time they've tried to "take over this land." The Ministry of Culture says the land is under state control, despite the companies' efforts to claim the property.